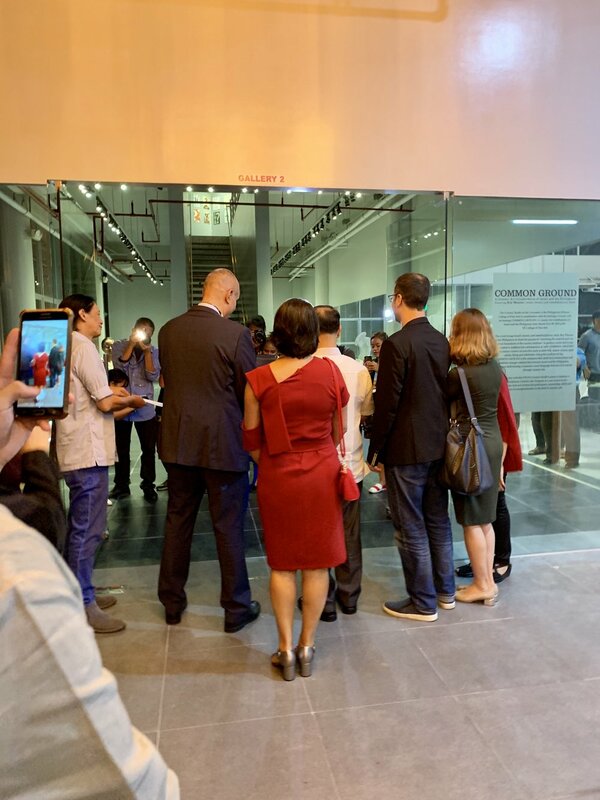 Last March 28, I got to witness the opening of Common Ground , a ceramic art collaboration of Israel and the Philippines. It was held at the UP College of Fine Arts (UPCFA). 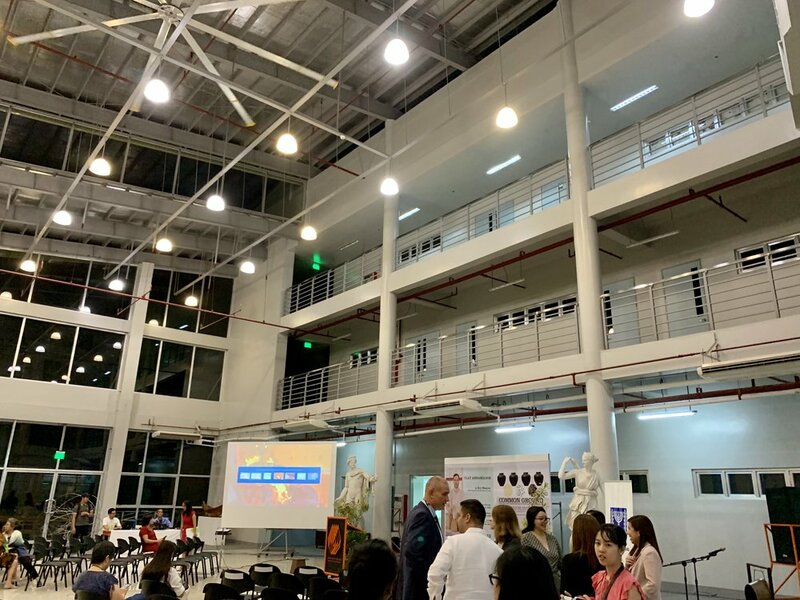 It was my first time at the beautiful new building of the UPCFA. 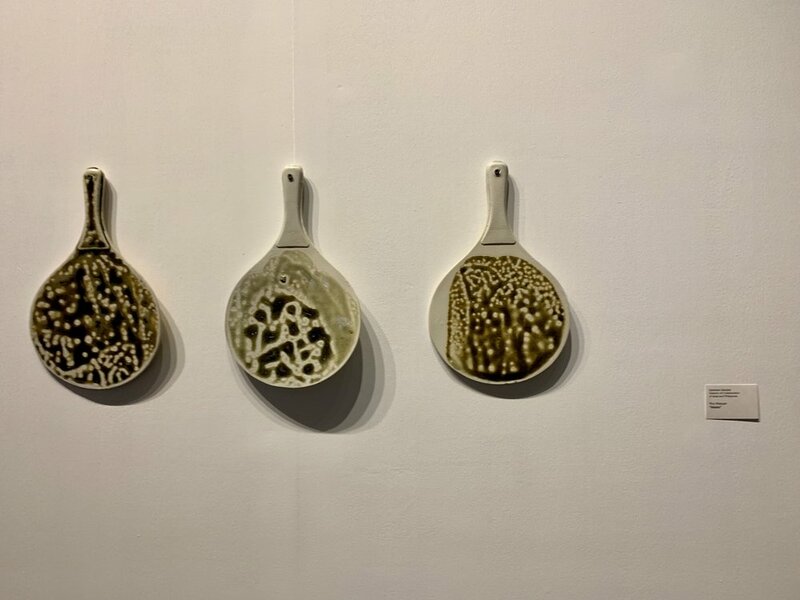 It was the perfect venue to showcase the exhibit, which was the culmination of a week-long partnership between noted Israeli ceramic artist Roy Maayan and the UPCFA students. 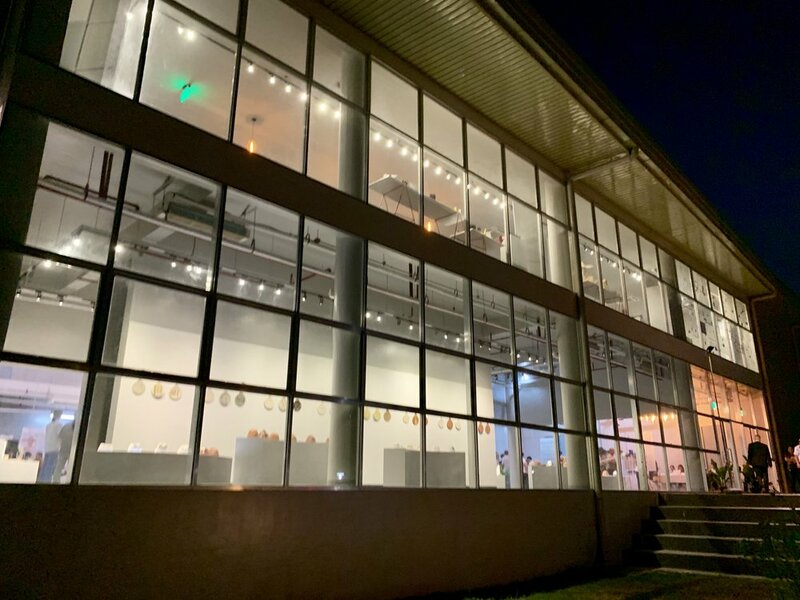 The college is planning to institute a multi-disciplinary Ceramic Arts Program as a new minor in the future, and this collaboration is in line with that vision. The Embassy of Israel has been a cultural partner of the UPCFA, and this collaboration has not only benefited the students and the artist himself, but also the public at large. 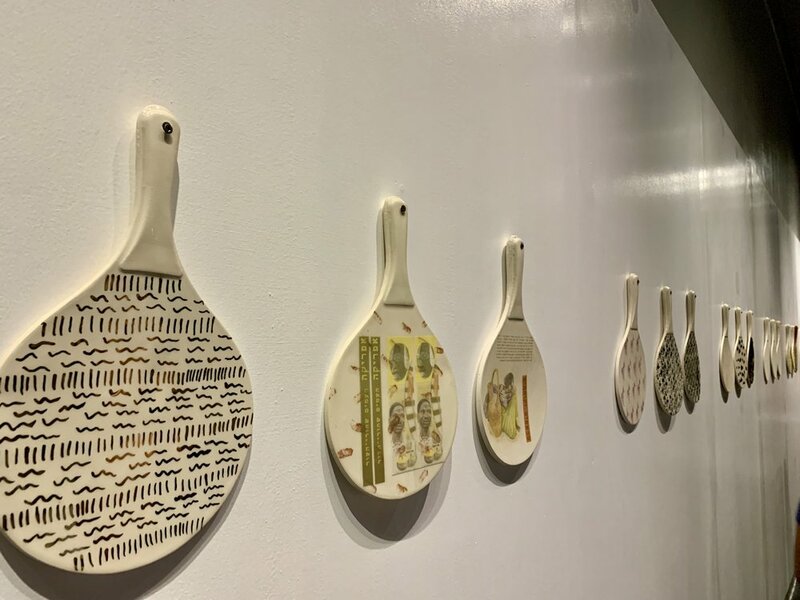 The exhibit is just the beginning of a visual conversation between the Israel and the Philippines through ceramic arts. Jezzel Wee, one of the artists in the exhibit, hosted the event and brought a youthful vibe to the evening. Dean Leonardo C. Rosete welcomed everyone by saying that ceramics are “vessels of cultural exchange”. The masterclasses and open studio which was shared by the guest artist and the students has created an environment where art could be created and cultural ties could be strengthened. To continue with the theme of cultural exchange, the Israeli Ambassador to the Philippines, H.E. Rafael Harpaz has mentioned in his speech that he made ceramics as a child. His early exposure to the arts has led him to seek “culture as the highest form of satisfaction” amidst his hectic schedule and diplomatic career. He cited as an example of his visits to local tourist attractions and the simple joy of eating halo-halo in the Philippines as his introductions to our local flavors. Later during the evening, I chatted with him about his early interest in ceramics. He said that while he no longer practices it, he is still appreciates the art. He is happy to continue the long-standing partnership between the Embassy of Israel and the UPCFA to bridge our common cultures and inspire the future of Philippine art. The UP President, Danilo L. Concepcion (second from left), has also spoken during the event. He said that since assuming his presidency, he has declared that each new building in all UP campuses should have an artwork. He mentioned that the education of artists is important for our culture, and that international art collaborations is essential for the university. He thanked the Embassy of Israel and Roy Maayan for their efforts in enriching the UPCFA with this endeavor. The UP Kontra-GaPi performed lively musical numbers during the intermission. Lastly, Roy Maayan himself said in his message that he was happy to witness firsthand the talents and skills of the UPCFA artists during their masterclasses and activities. As an Israeli “Clay Ambassador”, he shares his rich expertise to students and artists around the world. He mentioned that he has found friends amongst the Filipinos he has worked with during this collaboration. I witnessed this first-hand as the warmth between the artist and the students was present. Finally, it was time to open the exhibit! Roy Maayan has used the Tembel hat, an Israeli bowl-shaped cloth hat as his cultural “base” for his works in this exhibit. 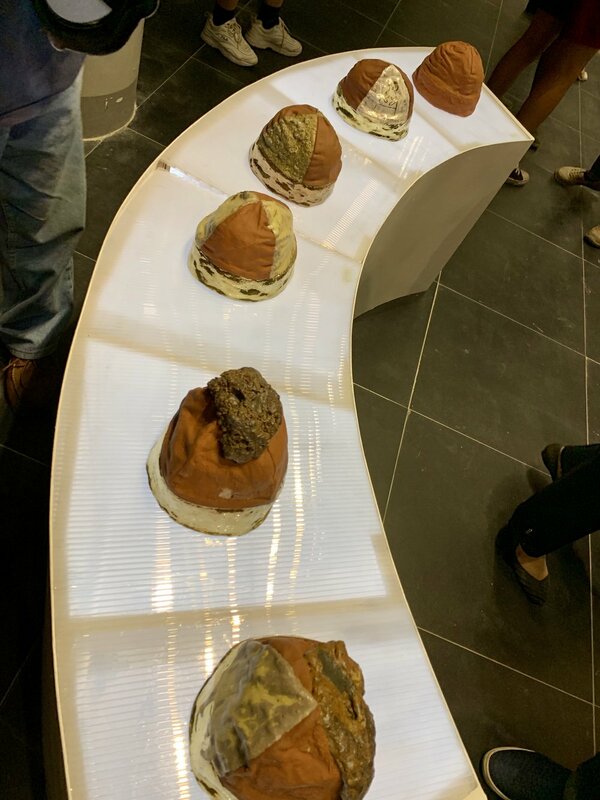 He mentioned that he combined tuff, a volcanic rock found his his country to be combined with some of the tembel hats, like the two bottom hats in this photo. He said that tuff and clay both share common processes of firing in order to form hard objects, and this is something that he highlights whenever he goes around as a clay ambassador. Every culture has something worth exchanging and elevating into art! Another Israeli element which Roy Maayan has used as a base for the exhibit is the matka. It is a wooden paddle which the UPCFA students has embellished with local elements, making it entirely their own. My personal favorite was “Hangover” by Blessi Bariuan, because it spoke to me about overcoming a night of drinking and paddling through to carry on the next day. Roy Maayan has given the students the freedom to inject local elements, while also contributing his own matkas with natural and earthy themes to showcase the commonality between all cultures: we are all made of the earth, and we can all collaborate together. The mix of students, faculty, the diplomatic community, the media, and art enthusiasts like myself has made the evening a memorable and fun exchange between two rich cultures. I was able to meet new friends from the Embassy of Israel, appreciate beautiful works of art made by an established Israeli clay ambassador and emerging Filipino artists, and witness the friendship formed over clay and culture. I am thankful that there are events that showcase the commonality that we all share in order to enrich our own respective experiences and perspectives. The future of art lies in collaboration, as the world is becoming more connected by globalization and social media. It is up to us to personalize the art that we make and share the art that we appreciate to make the world a better place to live in.